YOKOHAMA, Japan, June 11, 2018 - (JCN Newswire) - Mitsubishi Hitachi Power Systems (MHPS) upgraded the boiler combustion tuning system using artificial intelligence (AI) technologies at Taiwan Power Company's Linkou Thermal Power Plant, and demonstrated an improved fuel economy effect that reduces costs by up to around $1 million annually. This result was achieved by upgrading the plant's No. 2 boiler with newly added combustion tuning functionality that takes into account economic aspects such as boiler efficiency and auxiliary power, in order to enhance the combustion tuning with the aim of optimizing several process values. The AI system is one of the components of MHPS-TOMONI, MHPS' digital solutions service to support optimization of thermal power plant operations, and has been functional since the trial operations period in the latter half of FY3/17, prior to the start of commercial operation of the No.2 boiler in spring 2017. 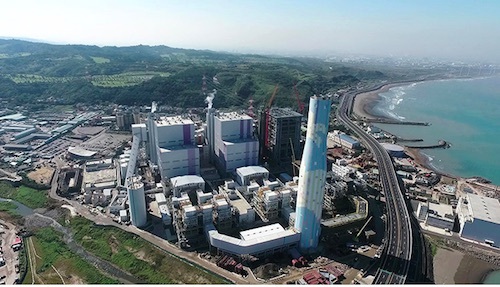 MHPS is providing the Linkou Thermal Power Plant with three sets of coal-fired supercritical-pressure boilers and steam turbines, each with outputs of 800 megawatts (MW). The first two sets are currently in commercial operation. Combustion tuning is generally conducted by experienced engineers who adjust the various parameters set during the program run-time, such as flue-gas emission characteristics, combustion balance, steam temperature characteristics, and boiler efficiency, in order to optimize the process. By taking time from the start of operations for the Linkou Thermal Power Plant's No. 2 boiler to become thoroughly familiar with its operation, and learn the characteristics of the boiler, the system was able to achieve combustion tuning functionality to handle a range of coal types. Further, the AI system was provided with information on additional changes to process values related to economic aspects such as boiler efficiency and auxiliary power, and was used to propose the optimal parameters. As a result, the AI's suggested parameters led to further improvements in economic efficiency. Through the development of the boiler AI system, MHPS aims streamline operational and maintenance costs through digital analysis of the large volume of complex data on boiler operations, and provide power companies in Japan and around the world with tools for indicating incompatibility and the early detection of anomalies. This combustion tuning system is a core component of a comprehensive system, currently under development, that will eventually enable AI-controlled operation of thermal power plants. The MHPS-TOMONI solution comprises three elements--operation and maintenance (O&M), performance enhancement, and operability improvement. Going forward, MHPS will continue to work to enhance its sophistication, including improving precision and expanding the scope of applicable functionality. We will also incorporate the results from this project in systems for other customers as part of the MHPS-TOMONI digital solution.